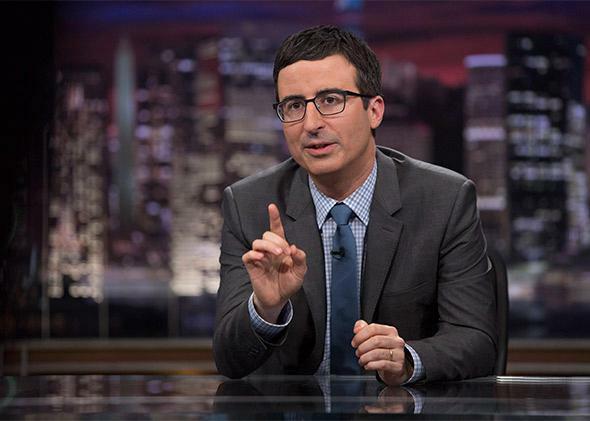 The premiere of John Oliver’s HBO show Last Week Tonight, reviewed. Like The Daily Show, with unbleeped swears! John Oliver hosts Last Week Tonight. “Welcome to whatever this is.” That’s how John Oliver kicked off the premiere of his new HBO series Last Week Tonight, which aired Sunday at 11 p.m. (and is now available in full on YouTube). It’s a line worth keeping in mind. Judging a TV series based on a single episode—always a tricky business—feels particularly inapt when the show is as obviously a work in progress as this one is. All a viewer can do, really, is ask whether that was an enjoyable half-hour and whether it seemed like a plausible precursor to many more enjoyable half-hours to come. The happy answer to both questions is yes. Last Week Tonight may not feel especially new, but it was mostly smart and repeatedly funny, and that is plenty. Unlike Stephen Colbert, who reinvented the format when he launched The Colbert Report and nailed it from the get-go—seriously, the man coined the Word of the Year in his debut episode—Oliver hewed pretty closely to the model refined and polished over nearly two decades by The Daily Show, where Oliver worked for six years and which he impressively guest-hosted last summer. On Last Week Tonight, Oliver sits behind a desk with a phony skyline behind him and makes jokes about the news. He also makes jokes about the way other people cover the news. At one point he threw to an interview he did with a powerful person in which the powerful person came off as wrongheaded and oblivious. It could have been 11:05 p.m. on a weekday with the dial tuned to Comedy Central—and not in a bad way. But the little differences between Oliver’s new show and his old one were more interesting—and more promising, too. Exhibit A: a longish segment that Oliver did about the general election in India, a subject he had mentioned in multiple interviews in the lead-up to last night’s premiere. Oliver cited it as the kind of story he could take on in a crowded field because basically nobody in American television has been covering it at all. And if, like me, the only things you’ve read about Modi vs. Gandhi are bemused and outraged 140-character bursts from Indian and India-loving friends in your Twitter timeline, then the segment was educational as well as amusing. Oliver tweaked the American media for its insufficient coverage, but the bulk of the bit was about candidate Narendra Modi, from his toilet pledge to his Tupac-like hologram to the extent of his responsibility for the murders of up to 2,000 Muslims in Gujarat. Less effective was an earlier segment about the botched health care website in Oregon. It may be an infuriating shame that Oregon spent a quarter-billion dollars and still couldn’t get its state exchange to work at all. But the writers at Last Week Tonight couldn’t find much fodder here beyond ukulele jokes pegged to one admittedly silly Cover Oregon commercial. Bringing in Lisa Loeb to lampoon it might have seemed like a coup if Portland’s penchant for twee actually had anything to do with the waste of taxpayer money. Instead, it felt like misplaced overkill. Which highlights something about the growing let’s-make-fun-of-the-news comedy niche. It’s important to be funny, but being right—and about worthwhile targets—matters, too. Fortunately, the one bit introduced in Oliver’s premiere as a regular installment was both: “Workplace of the Week” went to the NFL in an appropriately maddening report on the recent cheerleader uprising. The woeful-and-getting-worse state of labor in America is ripe for many more comical diatribes, and I hope that the show keeps mining this vein. In fact, as much as the show is clearly a work in progress, I don’t think it’s far from something that could work well for years. The closing interview with the recently retired director of the National Security Agency may have been the most Daily Show–like thing Oliver did, but it was still worth doing. The opening string of topical one-liners wasn’t great—and that style, as we should all know after decades of late-night monologues and ho-hum Weekend Updates, simply doesn’t lend itself to consistently good comedy. Oliver might be better off finding a “Word of the Day”–style feature that can kick things off in a more inventive fashion. With his penchant for we’re-better-than-this tut-tutting, a simple highlighting of the dumbest thing anyone did in the week that was, for instance, could go over big. Last night, Oliver didn’t waste any time walking us through what he’s going to do, or explaining that they’re still trying things out, or saying hello to his new viewers on HBO, or thanking his parents. He just got to work. I hope he keeps working at this for a while.